Samsung has been threatening to release a folding phone for the better part of four years, and now it looks like it might actually happen. In an interview with CNBC at the IFA trade show last week, mobile CEO DJ Koh, who has been talking up the company’s folding phone project any chance he gets, all but announced that we’ll get it first look at the new handset before the year is up. Based on his rather vague comments, it will probably be a preview rather than a full launch, and more than likely it will be branded as a prototype. It might not even have a name. But make no mistake: Samsung is determined to announce the world’s first truly foldable phone for one reason and one reason only: to be first, not because the world needs it. Or even wants it. Koh already told the world last month that Samsung would be launching its folding phone as soon as possible because he “didn’t want to lose the world’s-first title.” That’s a terrible reason to release anything, but worst when you’re talking about cutting-edge technology that consumers aren’t necessarily clamoring to have. ZTE already tried and failed to succeed with a folding phone, but Samsung’s will reportedly have an actual folding screen. Our phones are already plenty big. Samsung’s own Note 9 is 6.4 inches, Apple’s upcoming iPhone XS is rumored to be 6.5 inches, and the Pixel 3 XL could be 6.7 inches. Since anything bigger will be pushing the limits of what can fit into our pockets, Samsung, Huawei and others are turning to folding screens to make phones bigger without needing an extra bag to carry them. That’s a noble mission. We can debate forever whether our phones actually need to get bigger, but if they do, something needs to give. Our bezels can only shrink so much, and eventually a new kind of form factor is going to be needed. And folding seems like the best way to address it. Last year, ZTE tried its hand at a folding phone with the hinge-heavy Axon M, but Samsung’s new phone looks to have an actual screen that folds. But designing a new product to full a purpose or a need is a lot different than designing one to beat everyone else. Corners are cut, compromises are mades, and the end result suffers. Besides, Samsung’s relentless pursuit of first has rarely resulted in a product that people want. There was the Galaxy Gear smartwatch, which was a clunky, confusing mess, the original Galaxy Note, which was a behemoth of a handset with limited app support, the overpriced and buggy Galaxy S6 Edge, and a whole cavalcade of features that didn’t last more than a year. Samsung prides itself on being first, and likes to remind us of that any chance it gets. 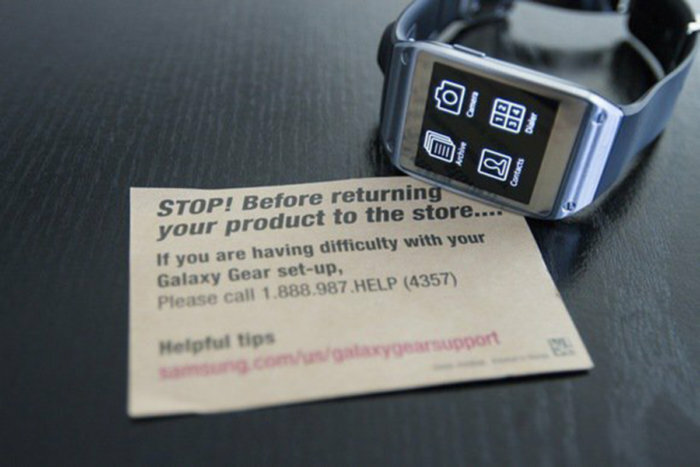 The original Galaxy Gear included a leaflet warning against returning your watch. If and when Samsung does unveil its first foldable phone later this year, it will get the appropriate headlines and buzz. Then we’ll find out the price which is likely to be well over $1,000. 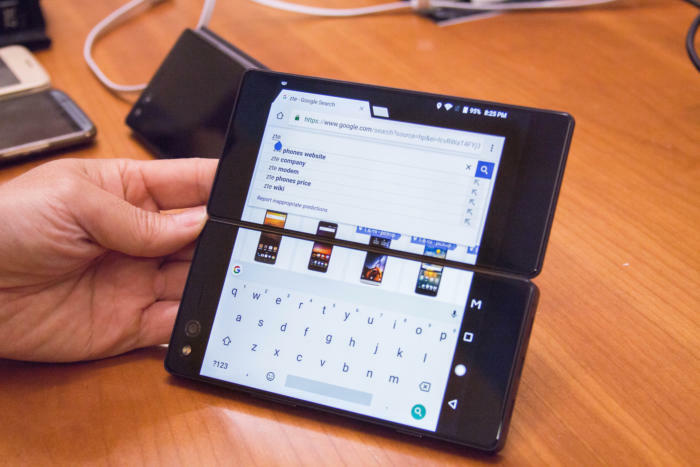 Then the review will roll in and people will decided whether they actually want to be the first person on their block with the first foldable phone. My guess is no. But while first can be a great badge of honor, it can also backfire. Samsung is best known as a premium phone company, but it’s already struggling to sell them this year. Neither the Galaxy S9 nor the Note 9 were buzz-worthy devices, and if Samsung is pushing its folding phone to market just for relevancy, that could be a problem. It’s not just that folding phone tech is bleeding-edge stuff, it’s that there are a lot of opportunities for it to go spectacularly wrong. The questions far outweigh the logistics, and Samsung’s track record with early technology doesn’t necessarily give me hope that it’s solved them all to satisfaction. I hope that’s the case. Because right now, it looks like the only reason Samsung made it is because they can.